The equipment, which had been offered as an option, alerts pilots of faulty information from key sensors. 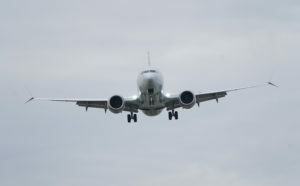 Regulators say both planes had similar erratic flight paths, an important part of their decision to ground the roughly 370 Max planes around the world. In an emotional gathering Thursday in the Kenyan capital of Nairobi, the victims’ relatives asked for lawyers to help them pursue their case. Another, Erick Mwangi, spoke of what could be an “expensive and tedious” legal battle. Macharia Kamau, principal secretary of Kenya’s Ministry of Foreign Affairs, advised the families to “come together as a group” as the country’s attorney general takes up the matter.